An extremely rare gemstone that receives its red color from trace amounts of manganese. 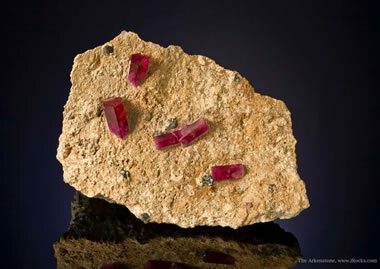 Red Beryl: Crystals of red beryl on matrix from the Violet Mine in the Wah Wah Mountains of Beaver County, Utah. Approximately 11 x 7 x 4 centimeters in size. Specimen and photo by Arkenstone / www.iRocks.com. Red beryl has been found at a few locations in Utah (Wildhorse Springs, Topaz Valley, Starvation Canyon), New Mexico (Beryllium Virgin prospect, Black Range, East Grants Ridge), and Mexico (San Luis Potosi). At these locations, crystals of red beryl are normally just a few millimeters in length and are too small or imperfect to facet. 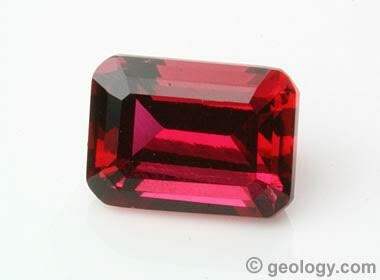 Red Beryl: A faceted red beryl with a beautiful medium red color. It measures about 5.2 x 3.9 millimeters in size. From the Wah Wah Mountains of Utah. Photo by TheGemTrader.com. Why Is Red Beryl So Rare? Red beryl is a rare mineral because its formation requires a unique geochemical environment. First, the element beryllium must be present in large enough amounts to form minerals. Second, manganese must be present and available at the same time and location. Third, the correct geochemical conditions must be present for beryllium, manganese, aluminum, silicon, and oxygen to crystallize into red beryl. For gem-quality red beryl to form, fractures and cavities must also be available to serve as a space for nice crystals to grow. Color Pink to deeply saturated red. Streak Colorless (harder than the streak plate). Diagnostic Properties Crystals are prismatic hexagons with flat terminations, and without striations. Hardness and relatively low specific gravity. Red color. Trace amounts of manganese produce the red color. Crystal System Hexagonal (occurs in prismatic to tabular crystals), often etched. Uses Gemstones for jewelry and collectors. Specimens for mineral collectors. At the Ruby-Violet mine, the topaz rhyolite member of the Blawn Formation is a lava flow that erupted from volcanic vents about 18 to 20 million years ago. As the lava flow moved and cooled, fractures and cavities developed in the rock. These openings allowed superheated beryllium-rich water and gases to enter the formation. These were being released from a magma chamber that was degassing below. At the same time, surface water was entering fractures above and moving downwards. It carried oxygen, manganese, aluminum, and silicon leached from the rocks above. Superheated water and gases from below encountered cool waters from above, which produced a change in geochemical conditions that triggered mineral crystallization within the fractures and cavities of the topaz rhyolite. This crystallization is thought to have occurred at temperatures between 300 and 650 degrees Celsius. Red Beryl Crystal Cluster: This cluster of crystals is one of the finest examples of red beryl in the world. It is a small specimen (all specimens of red beryl are small), measuring 6 x 2.7 x 2.6 centimeters in size. It was collected from the Harris Claim in the Wah Wah Mountains of Utah. Specimen and photo by Arkenstone / www.iRocks.com. 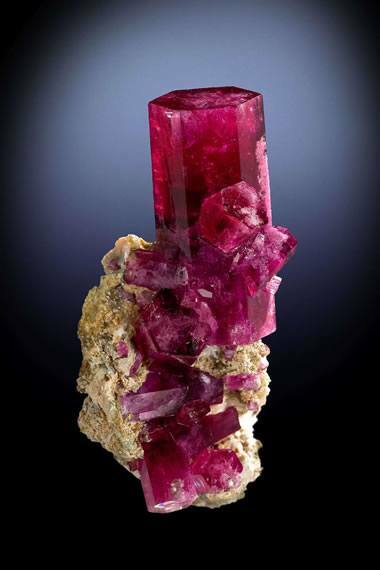 The largest crystals of red beryl found at the Ruby-Violet claim are about 2 centimeters wide and 5 centimeters long. But most gem-quality crystals are under 1 centimeter long. This limits the size of faceted stones that can be produced. Red beryl rough is rarely larger than one carat in weight and most faceted red beryls are only 1/4 carat or less. Fortunately, most specimens of red beryl from Ruby-Violet have a rich saturated red color. This allows tiny faceted stones to exhibit a vivid red color. Red beryl of 0.2 carats or less is sometimes used as colorful melee. Color-matched melee with a vivid red color can sell for over one thousand dollars per carat. Nice gems above one carat are very rare and cost several thousand dollars per carat. Like its beryl cousin, emerald, red beryl is often included and fractured. These stones are often impregnated with resin to fill fractures, stabilize, and improve durability and appearance. Similar treatments are regularly done to emerald and are acceptable if disclosed to buyers. What Gemstone is Found in Utah That is Rarer Than Diamond and More Valuable Than Gold?, by Carl Ege, article published on the website of the Utah Geological Survey, accessed in January 2016. Red Beryl from Utah: A Review and Update, by James E. Shigley, Timothy J. Thompson and Jeffrey D. Keith, Gems & Gemology, Winter 2003, pages 302-313. Red Beryl: Stinson's Gemcutting, information page on the company website, accessed in January 2016. Occurrence Model for Volcanogenic Beryllium Deposits by Nora K. Foley, Albert H. Hofstra, David A. Lindsey, Robert R. Seal, II, Brian Jaskula, and Nadine M. Piatak, Chapter F of Mineral Deposit Models for Resource Assessment, Scientific Investigations Report 2010-5070-F, United States Geological Survey, 43 pages, 2012. Some people use the name "red emerald" when referring to red beryl. This name is a misnomer because emerald, by definition, is green. The Federal Trade Commission disapproves of this type of name because it might cause some people to think that red beryl is an unusual variety of emerald when it is not. Synthetic Red Beryl: A beautiful synthetic red beryl faceted into a 7.4 x 5.4 millimeter emerald-cut stone weighing 1.23 carats. It would be unprecedented to find red beryl rough with comparable clarity and size in nature - and if such a specimen was discovered as a nicely formed crystal, it would be extremely valuable to a collector or museum as a mineral specimen. Therefore, it would probably not be cut into a faceted stone. Maynard Bixby discovered red beryl in Utah in 1904. Two years later, Alfred Eppler gave it the name "bixbite" in honor of Bixby. That name was often confused with "bixbyite," a manganese oxide mineral also named after Bixby. The name bixbite was depreciated by the World Jewelry Federation. It is seldom seen today outside of the historical literature. Lab-created red beryl has the same composition and physical properties as natural red beryl. Gemologists familiar with the materials are able to distinguish lab-created from natural red beryl on the basis of crystal shape, inclusions, and absorption spectra. Lab-created red beryl cut into faceted stones sells for a small fraction of the price paid for natural stones.